We have some advice for her even though she is obviously going to choose Stanford. But since you posed the question, let’s get philosophical. This is a good exercise. If you are deciding between a few really great schools, it’s best to break the criteria down into categories and compare. The categories we like to use are location, program, and culture. Before we dive into the question, we want to give a huge congrats to the student who emailed us! This day and age, getting into so many great schools is a true accomplishment. We’re proud of you! There are a few factors to consider here. Let’s assume that in this students case, all of the choices are an airplane ride away, so mode of transport may not be a factor. But this student might consider the differences between SoCal (where USC is) and NoCal (where Stanford is). SoCal offers proximity to the beach and access to the hustle and bustle of Hollywood, something a theater major may want to consider. NoCal, on the other hand, has a robust arts community and plenty of outdoor offerings of its own. 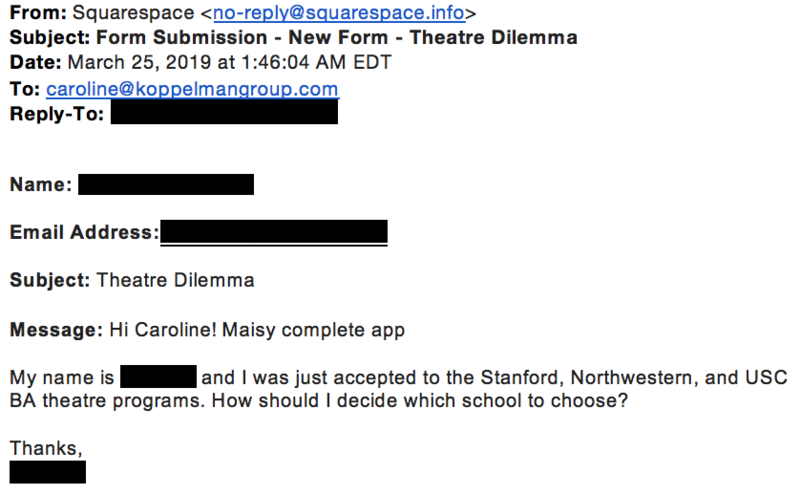 You’re 17 or 18 years-old and if you’re like our student in the email and you’ve applied to a specialized program such as theater, you probably have a pretty clear idea of what you want to do. All of the theater programs at the schools in question are a little bit different. Start by crossing out the names of the schools and write down data points about each program on separate sheets of paper, including course offerings. Compare them and try to decide, objectively, which program appeals to you the most. You shouldn’t just consider the professors and classes you’ll be taking, but also think about the extra-curricular offerings and of course, career opportunities. Northwestern’s Theater program has connections to performance groups in Chicago. Stanford (where, again, you’re obviously going) offers numerous opportunities to perform in top-notch on-campus productions. Both points should be considered. Lots of kids ask us how we know so much about the general feeling at various universities. The answer is, it just comes with experience. We are able to help students hone in on schools that match their particular personalities because, over the years, we’ve cultivated an arsenal of information. You have to do your research for this one and we really don’t know any shortcuts. If you haven’t visited the campuses of these particular schools, draw from the experience you had visiting other schools. If you liked the feel of a medium-sized school you visited, consider Northwestern or Stanford. If a school with a big sports following/game day ~festivities~ sounds fun, consider USC. Stanford has a bit of a Silicon Valley vibe going on and since you’re going there, it might be useful to know that it’s a place for people who make deals and like big ideas. Again, congratulations to this student on most likely accepting her offer to Stanford. Need some help deciding which university is the best fit for you? Reach out to us here. We know a lot about the specific characteristics of major universities across the country. Newer PostI Just Got Rejected from All of My Dream Schools. What Do I Do Now?